Launched last month, both the Samsung M-Series smartphones will be available on Amazon India and Samsung e-shop. 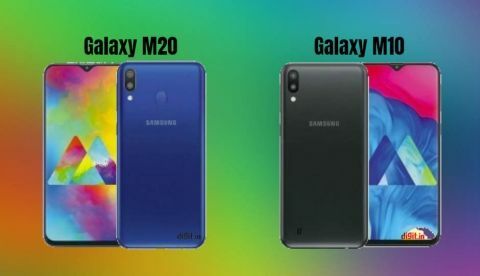 Samsung Galaxy M10 and Galaxy M20 first sale today at 12PM. The phones will be available on Amazon India and Samsung e-shop. The company is offering a Damage Protection plan on both the phones. The first sale of Samsung’s millennial-centric smartphones, the Galaxy M10 and the Galaxy M20, will start at 12PM today. Both the phones will be available on Amazon India and Samsung e-shop. Samsung is offering a Damage Protection plan for the Galaxy M10 at Rs 699 and for the Galaxy M20, users have to pay Rs 1199 to get the same. Amazon has also added a Notify Me button for those who would like to get notification when the devices are available on the platform. Those who want to purchase either the Galaxy M10 or M20 can avail the No-Cost EMI option for up to 6 months. Under the Jio Galaxy Club offer, which is available on Amazon India, Jio subscribers can get benefits worth Rs 3,110 in the form of additional data on the Rs 198 and Rs 299 prepaid plans with the purchase of any of the phones. Buyers can also get mobile cases and covers starting at Rs 149. Both Samsung Galaxy M10 and Galaxy M20 feature an Infinity-V display, which is basically the waterdrop notch. Unlike some Chinese rivals, the Samsung Galaxy M10 comes with L1 Widevine certification as well, which means that one will be able to stream HD content on the phone via online streaming services. The highlight of the Galaxy M20 is its large 5000mAh battery that the company claims can deliver up to two days of battery life. The Samsung Galaxy M10 features a 6.22-inch Infinity-V TFT HD+ screen offering a 19.5:9 display aspect ratio. Under the hood, the smartphone is powered by the company’s Exynos 7870 SoC, coupled with 2GB or 3GB RAM and option to select between 16GB and 32GB of local storage. In terms of optics, the Galaxy M10 features a dual rear camera setup with a 13MP primary sensor with f/1.9 aperture and a 5MP secondary ultra wide-angle sensor with f/2.2 aperture. There is a 5MP sensor on the front and the phone supports only Face unlock as there’s no fingerprint sensor. The device runs on the new Experience 9.5 UI, which is based on Android 8.1 Oreo and is backed by a 3400mAh battery. The Samsung Galaxy M20 is a more powerful sibling of the Galaxy M10 and it features a 6.3-inch FHD+ LCD Infinity-V display with a 19.9:5 aspect ratio. The phone is powered by the Exynos 7904 chipset. The phone comes in two variants with 3GB and 4GB RAM options, and users can choose between 32GB and 64GB of internal storage capacities, respectively. The phone’s internal storage can be expanded up to 512GB via a microSD Card. Just like the Galaxy M21, the Galaxy M20 also runs on the new Experience UI 9.5 that is based on Android 8.1 Oreo. In the camera department, the phone sports a 13MP + 5MP dual rear camera setup where the primary sensor is paired with an f/1.9 aperture lens while the other sensor gets an ultra-wide lens with f/2.2 aperture. On the front is an 8MP camera with f/2.0 aperture. Update: Samsung has announced that "it was a BIG day one for Galaxy M," as it sold out all the units of the devices on Amazon. However, the company did not give the numbers of how many devices were cumulatively sold on Amazon as well as on the Samsung e-shop during the sale period. The Indian arm of the South Korean company also announced that the next sale of Galaxy M Series is planned for February 7 at noon on Samsung.com and Amazon.in.